"I am suggesting that we look for the great good among those with whom we associate and live, that we speak of one another's virtues and positive qualities more than we speak of one another's faults, that optimism replace pessimism, and that our faith exceed our fears. When I was a young man and tended to be critical of others, my wise father would often say, 'Cynics do not contribute, skeptics do not create, doubters do not achieve.' 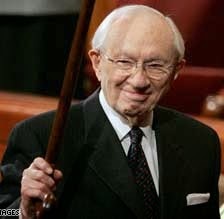 Who wants to be around someone who is always forecasting doom? Who wants to be fed a steady diet of the negative? Optimism, on the other hand, and looking on the bright side, refreshes everyone. "In my ninety-plus years, I have learned a secret. 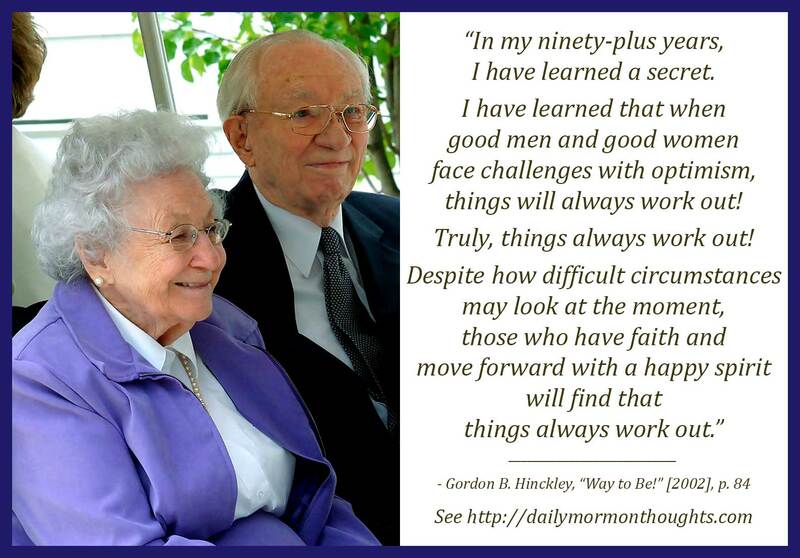 I have learned that when good men and good women face challenges with optimism, things will always work out! Truly, things always work out! Despite how difficult circumstances may look at the moment, those who have faith and move forward with a happy spirit will find that things always work out." 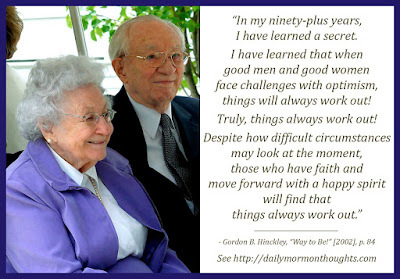 President Hinckley was a quintessential optimist. He regularly counseled Church members to seek the positive, to look on the bright side, and to focus on the good. This is a good example of that attitude in his writings. These attitudes apply to how we treat and interact with one another, as well as how we think and approach our personal life situations and challenges. "Things always work out"—he says it three times, bringing greater emphasis to the point. Facing our challenges with optimism and faith, with a happy spirit in spite of the difficulties, gives us power beyond expectation in finding good solutions and overcoming the problems.